We are offering Malt Extract Powder to our clients. Our range of Malt Extract Powder is produced from malt by the advanced technology of enzyme extracting, separating and vacuum-drying which endows this product with high nutrition, well solubility and full-bodied aroma. It can be applied widely in many foods such as milk, ice cream, bread and pastry. Owing to our in-depth knowledge in this domain, we are specialized in providing Malt Extract Powder. The liquid extract is spread over various trays to form a batch. It is placed in a vacuum oven where it is dried into a solid brittle cake. The cake is then granulated through a mill to produce a free flowing powder. This process is carried out to produce special types of malt extract powder. Storage: Store in cool and dry place, once open use it immediately. Powder Malt Extract is manufactured by drying Liquid Malt Extract under vacuum. The vacuum allows evaporation to happen at a lower temperature, hence retaining the flavor. 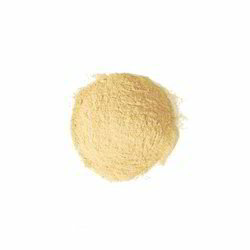 It is a pale colored powder with a characteristic malty flavor, having a moisture content of about 3 %. It can be stored at dry place at room temperature. Dried malt extract powder available in various specifications according to customer requirements.